Scientists at a number of companies have made progress in helping DARPA mitigate the effects of a Radiological Dispersal Device (RDD). If an RDD (also called a "dirty bomb" - an explosive laced with radioactive substances) goes off in an urban environment, downwind buildings will be contaminated with very fine radioactive particles. At present, the only real remedy is to tear down the structures and rebuild. Isotron has developed a polymer coating that could be added to water sprayed from fire hoses. The sprayed-on coating would dry to a blue film that would trap contaminants. This would help mitigate the airborne spread of the contaminants. Surfaces would then be hosed down with compounds by other developers to detach radioactive atoms bound to iron oxides, clays or other ingredients in porous building materials. A special gel composed primarily of polyacrylates (also used in disposable diapers) and nanoscale particles is used to coat surfaces and draw out contaminants. 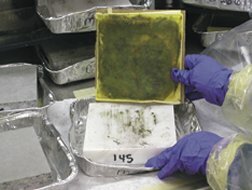 On concrete, the gel absorbs more than 98 percent of radioactive atoms in about a half hour. He unclamped a fire-extinguisher-like affair; opened the door of a tiny room. "In here!" He cradled the device and opened four valves. Fast as he was, she was ready for the gush of thick, creamy foam from the multiplex nozzle. "Oh, Dekon?" she asked. "I've read about it. I rub it in good, all over me?" "That's right. Short for 'Decontaminant, Complete; Compound, Absorbent, and Chelating; Type DCQ.' It takes care of radiation, but speed is of the essence. All over you is right." Read more at Science News; thanks to Winchell Chung for the story tip and quote.